Student loans are an enormous economic burden for Americans, coming in right behind mortgages as the largest kind of consumer debt. And although student debt is often used as a political talking point, you can rest assured that for now, your student loans aren’t going away. There are, however, some ways you can reduce the burden of your student loan debt by pursuing better loan terms, shorter repayment periods or lower monthly payments. Here are 10 potential ways to improve your student debt scenario. Government employers have long offered loan repayment assistance or tuition reimbursement programs. But more private companies are now initiating student loan assistance policies, in part to attract millennial talent. If you’re hunting for a job, pay attention to the benefits offered by potential employers. 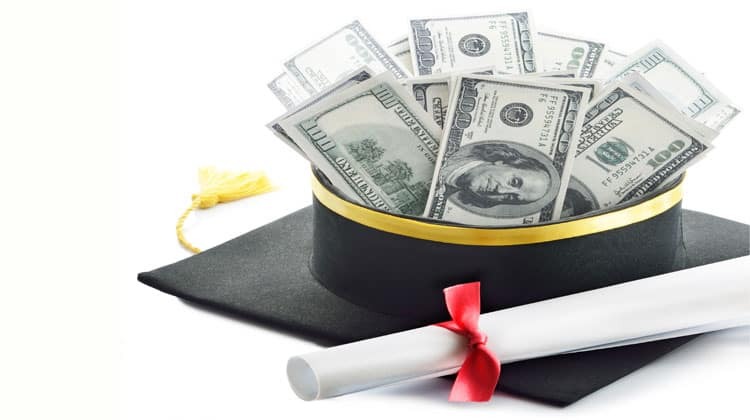 Some offer student loan assistance as part of their benefits package. If you’re already employed, double check with your current employer on the possibility you’re missing out on a valuable policy. Most federal student loans are eligible for consolidation, a process in which multiple student loans are combined into one loan. The interest rate is then calculated using a weighted average of the collective interest rates. While this won’t necessarily save you money on interest, it can simplify your repayment by consolidating them into one bill. Consolidation could alter your monthly payments by changing your repayment period. Choosing a longer repayment period would lower your monthly payment but increase the overall amount of money you repay. Choosing a 10-year standard repayment plan would result in the highest possible monthly payment but minimizes the time and money required to pay off your loan. You may also become eligible for alternative repayment plans and potential loan forgiveness that may have been unavailable before consolidation (more on those in a minute). Some federal student loans, like Perkins Loans, do not accrue interest while you’re enrolled in school and during the grace period after graduation. If you start making payments before interest kicks in, you can reduce the overall interest you’ll pay. And while it may be extremely difficult to do, paying the balance in full ahead of time will render your loan interest-free. In the same vein, paying down the principle on your loan by paying extra each month will reduce your balance faster and save you money. If you have multiple loans to pay, you may want to pay more money toward your higher-interest loans first to get them out of the way. If you work for a government organization or a qualifying not-for-profit, you may be eligible for public service loan forgiveness. You will have to be employed full time and have the right kind of loans and payment type. Under this program, your student loan will be forgiven after a certain amount of payments. You could get a small reduction in your loan interest rate by signing up for online statements and electronic payments, where your lenders will automatically deduct your monthly payment from your checking or savings account. “Many lenders and loan servicers will offer an interest rate discount of 0.25% for signing up for direct debit and/or online statements. This is an easy way to save a little on interest over the course of your loan,” said Farrington. If you have a mortgage with some available equity, you could roll your student loan into your home equity line of credit (HELOC). This could reduce your interest rate and result in tax benefits. There are many repayment plans available to borrowers, including income-based repayment (IBR), Pay As You Earn (PAYE), Revised Pay As You Earn (REPAYE) and income-contingent repayment (ICR). These plans will adjust your payment amount based on your income. Here’s what you need to know about some drawbacks to some income-based repayment plans. “There are several different types of plans but they all cap your monthly payment at a certain percentage of your discretionary income,” said Farrington. There are also repayment plans that will adjust the repayment period (for instance, extend the lifetime of the loan) or restructure your payments (for instance, increase monthly payments over time). Federal borrowers can change repayment plans at any time for free. See this post for a explanation of other common student loan terms. Student loan deferments and forbearance let you temporarily pause or reduce your monthly payments. Deferment stops interest from accruing on certain types of loans during the deferment period, while loans in forbearance always continue to accrue interest. You’ll have to work directly with your loan servicer to access these options. There are strict eligibility requirements, but they are wide ranging and could include financial hardship, unemployment, changing jobs, being deployed in the military or having medical expenses. Here’s a quick rundown on how deferment or forbearance can affect your credit. You can refinance your federal student loans with a private lender to get a better interest rate, which could save you thousands of dollars in interest in the long run. To get the best interest rate, you’ll need good credit. Don’t know where your credit stands? You can check using this free service.